Seamless is a fashion show that fuses cutting-edge style with the latest advances in technology. 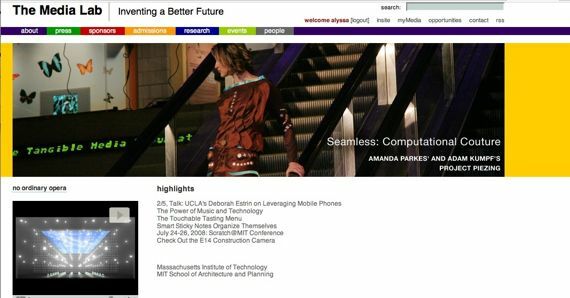 The January 2008 edition of Seamless transformed Boston’s Museum of Science exhibit halls into a catwalk for “computational couture,” showcasing 20 selected, emerging designer teams from around the globe and creations that push the boundaries of wearable technology. The dress pictured here is called Piezing. Created by Amanda Parkes and Adam Kumpf, Piezing generates its own power using the natural gestures of the human body in motion. Around a person’s joints, the garment is specially woven with piezoelectric film fibers which convert mechanical strain into electrical voltage as a person walks. The voltage created can be stored in coin batteries disguised as buttons and later discharged into any portable. I just modeled the piece, but it’s too cool not to be included in website. (Descriptions adapted from http://seamless.sigtronica.org/).